Are you looking to improve efficiencies and productivity in your business? 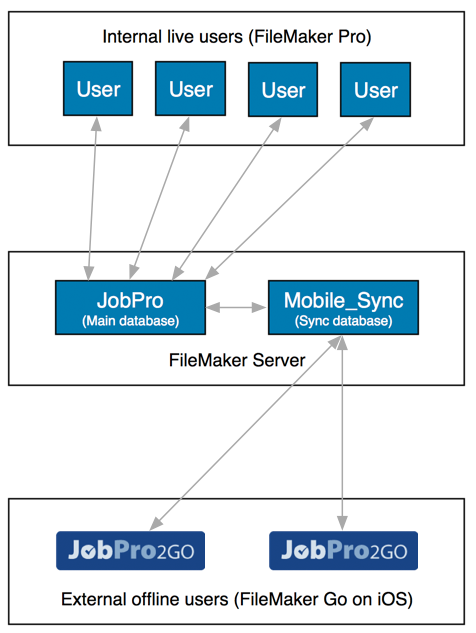 JobPro Central is a comprehensive business solution and FileMaker template that is built on the FileMaker Pro platform. If you have looked around at packaged app’s and could not match your requirements then you are our type of customer. We can customise our template to match the exact workflows you require – from the very simple to the very complicated. JobPro is packed full of features out of the box. Head on over to our features page to take a look. The filemaker platform is truly unique due to its ability to be quickly and cost effectively customized by either you (open source license required) or by our team. Millions of users worldwide rely on the filemaker platform and filemaker templates to manage business tasks from managing contacts, sales pipelines, sales orders, storing documents to manufacturing, rentals and shipping. You can use filemaker pro to run our solution on desktop machines (Mac and Windows), FileMaker Go (Free from App Store) to run solutions on iPad / iPhone. Use FileMaker server to securely manage your information with all your users. We can also support FileMaker web direct to run solutions in a browser if required. If you would like to talk to us about customisation requirements please use our Contact Us page. Not unique to your business. You are paying for some functionality that will not be used. Only pay for functionality you need.